Did you know that we have 249 listings for different types and variants of Subaru engines that we hold in stock? That’s an incredible amount of engines to hold at anyone time but we need to do this due to the huge amount of Subaru engines that we ship to workshops all around New Zealand! 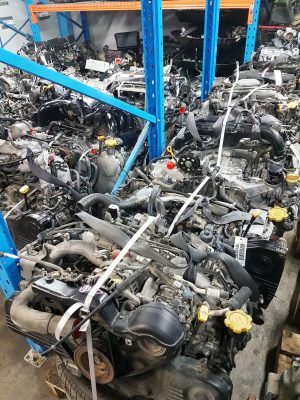 We basically stock just about every type and variant of Subaru engine for all Subaru models available in New Zealand and cover models from 1992 right through to the latest models, all of our Subaru engines are carefully run tested by us and carefully checked before they are removed from the vehicle and placed into stock ready for sale. Our engines are sold as a long motor, this means that you need to use your own accessory items such as manifolds, alternator starter motor etc, we do this to help with vehicle compatibility as sometimes engines from one model of the same year may have different accessory items on them that simply won’t work when used in your car so it’s a lot easier and adds reliability when you use your existing bolt on items and sensors when fitting a replacement Subaru engine. The exception to this rule is when we supply you with one of our turbo engine kits, these kits are complete engines with wiring loom and ECU and are used for performance transplants or racing purposes.